Yesterday Radiance of the Seas emerged from one of the most extensive refits that Royal Caribbean have ever undertaken on one of their ships. As part of the $70 million Royal Advantage program, Radiance of the Seas spent 21 days in drydock benefitting from a facelift bringing her in line with the rest of the modern fleet. Lisa Bauer, Senior Vice President, Hotel Operations, Royal Caribbean International, said: "The Royal Advantage comprises some of the industry’s most innovative onboard amenities, programs and Gold Anchor Service that make up the most contemporary cruise vacation. By introducing almost all of the same specialty restaurants that can currently be found onboard Allure of the Seas as well some of the Oasis-class ships’ most popular concepts to Radiance of the Seas, guests can enjoy a variety of brand new onboard experiences." The ships revitalisation includes several new facilities, from great dining venues to improved childcare venues — Royal Babies and Tots Nursery. The ship includes 12 new accommodations, including new family, interior and outside staterooms, a new Concierge Lounge for suite guests and a new Diamond Lounge for Crown and Anchor Society members. 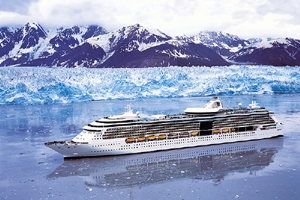 The ships also includes ship-wide Wi-Fi and flat-screen TVs in all the staterooms. Boardwalk Dog House: Guests can choose from traditional hot dogs, wieners, brats, sausages and other delicious linked meats and a variety of toppings to split a long bun (open for lunch and dinner, complimentary). Giovanni’s Table: An Italian trattoria featuring Italian classics served family-style (open for lunch, $15, and dinner, $20). Izumi: Featuring mouthwatering flavours and a sushi bar with hot-rock cooking, the pan Asian cuisine restaurant is a no-hassle, authentic dining experience (open for lunch and dinner, $3.00 cover charge for lunch and $5.00 for dinner plus a la carte menu pricing). Park Café: An indoor/outdoor gourmet market featuring salads, sandwiches, soups and pastries (open for breakfast, lunch and dinner, complimentary). Rita’s Cantina: A casual yet vibrant indoor/outdoor restaurant, catering to families by day, and adults by night; offering traditional Mexican fare, a comprehensive selection of margaritas and live guitar music and dancing for evening entertainment (open for lunch and dinner, $3 cover charge and a la carte menu pricing). Samba Grill: Styled after popular Brazilian steakhouses, the churrascaria is an interactive experience where guests choose from a variety of meats, chicken and seafood brought table-side by servers, ready to slice and serve upon request (open for dinner, $25 per person). Chef’s Table: An exclusive and private experience co-hosted by the executive Chef and Sommelier for a wine pairing dinner of five courses (open for dinner, $95 per person). Radiance of the Seas is the third ship to enjoy the Royal Advantage treatment after Liberty of the Seas in January and Freedom of the Seas back in March, with one more ship, Splendour of the Seas due for the upgrades and a polish this coming October. Now she is out of drydock Radiance will return to Alaska for the summer, where she will be offering seven night alternating Northbound and Southbound itineraries, before heading to Australia and New Zealand for the winter 2011 season.